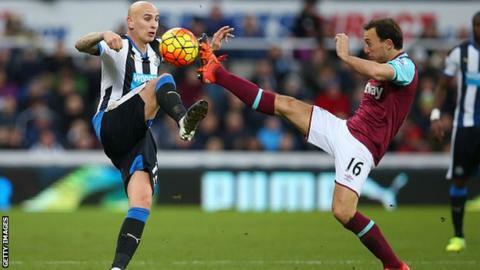 Newcastle's £12m purchase of Swansea midfielder Jonjo Shelvey was the best-value signing of the January transfer window, according to a study. Analysis from the CIES Football Observatory says the 23-year-old England international is worth £23.5m. Its data suggests Chinese club Guangzhou Evergrande paid £18.43m too much when they spent £31m on Atletico Madrid striker Jackson Martinez. Bournemouth are said to have overspent on £7m Norwich striker Lewis Grabban. According to the CIES research team, which analyses transfers in Europe's big five leagues, that was more than £6m too much. The study also suggested Newcastle overpaid by £5.4m when they spent £12m signing England winger Andros Townsend from Tottenham. That move went through on 27 January, the same day Chinese club Jiangsu Suning signed Brazil midfielder Ramires. The 28-year-old moved in a deal believed to be worth about £25m, which the CIES study claims is £8.36m more than his value. The CIES Football Observatory team of academics estimates transfer values based on 1,500 fee-paying deals involving the big five European leagues since June 2009. It takes into account the "inflationary trend" of transfer fees and calculate a player's worth based on their statistics in six key areas - age, position, contract, international status, experience and performance. Footballers with the highest transfer values in the study generally play in competitive teams, are active full internationals, play in attacking positions, have long-term contracts and are under 27 years of age. The full findings of the CIES Football Observatory's 2016 winter transfer window assessment.